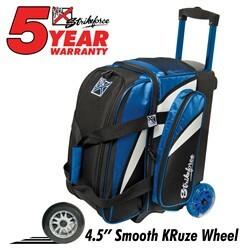 This KR Cruiser Smooth Double Roller Royal/White/Black has many features to offer bowlers! If you're looking for a bag that can hold two pairs of shoes in a separate compartment, then this bag is for you! After careful research of similar bags, I made a decision to purchase this unit. After receiving the product, and stocking all my gear, I was very pleased with how one can organize the bag. It's construction is good, and the mechanical parts seem to be strong. I also like the fact that if the handle is damaged later, it can be replaced. Nice Bag! I would buy this product again. Durable material. Rather have a zip compartment on the handle end instead of the netted compartment. I have a bag almost identical to this bag, and standing on end with 2 bowling balls in it, while stored for the year, has made that end of the bag a little wobbly and soft. Recommend laying flat all the time if you have the room. Hello Jo! Yes, the handle does retract. We have not hand any feedback indicating that it would not stand upright. We have only heard of some bags having issues standing upright when there are no bowling balls in them. Hello Evanw01! The Kr Crusier Smooth Double Roller Royal/White/Black will be around 10lbs empty. Does the warranty cover issues with wheel, handle, and zippers? Does it hold 2 balls? Due to the time it takes to produce the KR Strikeforce Cruiser Smooth Double Roller Royal/White/Black ball it will ship in immediately. We cannot ship this ball outside the United States.